Thanks for your patience. Previous newsletter was just over 1 year ago, but all will be explained if you read on! You can find the rest of this article here – Improve your Juggling with Note Taking. 2013 – Things Can Only Get Better! You might be wondering why it has taken a year to send out the next newsletter (greetings to all new subscribers who haven’t received anything since signing up also!). The previous version of this website stopped working properly over a year ago (a lot of links refused to work) and I was waiting for the developers to resolve this problem before I sent out any news. They eventually announced that the only thing to consider was a complete redesign of the website and so work went underway at the start of January 2013. At the end of January, way before my new site was ready to launch, I suffered a severe hacking attack which brought mine and a number of other websites on the same server down. It was going to be too costly for my developers to restore the old website, and so we had to launch my new website way before it was ready! This has meant several months of hard work on a live version of the website, before I finally (and very happily) officially relaunched the Jugglingworld website and online store at the end of March! Let’s hope that the rest of 2013 goes better! I now have 5 x 30min Shows aimed at Primary and Nursery aged groups. Latest show was performed for the first time in March and was entitled “The History of the Circus“. Ideal for Schools and Parties. I have been booked to appear at a Christian Festival ran by CVM (Christian Vision for Men). It’s called the Gathering and there are a few tickets left. Visit CVM website for more info. Maybe see you there?! My YouTube Channel now has over 80,000 views. I have sorted all my clips into Playlists so that you can find the type of video clip you might enjoy watching. 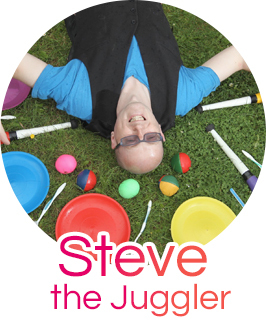 Showreels & Tutorials Playlist – – let Steve teach you how to Juggle and spin plates etc. Many of these clips also appear throughout the tricks section of my website. Juggling Convention Playlist – there should be many more video clips in this section after I attend the British Juggling Convention next week (9-14 April)! Please consider subscribing to my YouTube channel and if you can rate or review any clips you watch, I would very much appreciate it!